Nestled among the brick and history of one of the University’s original buildings, the students partake of pizza and Belgium microbrews. But don’t let the cozy setting fool you. They also chew on tough concepts of leadership and personal motivation, and with class participation counting for more than half the grade, they know better than to get too comfortable. Then comes this question: What should the purpose of business be? 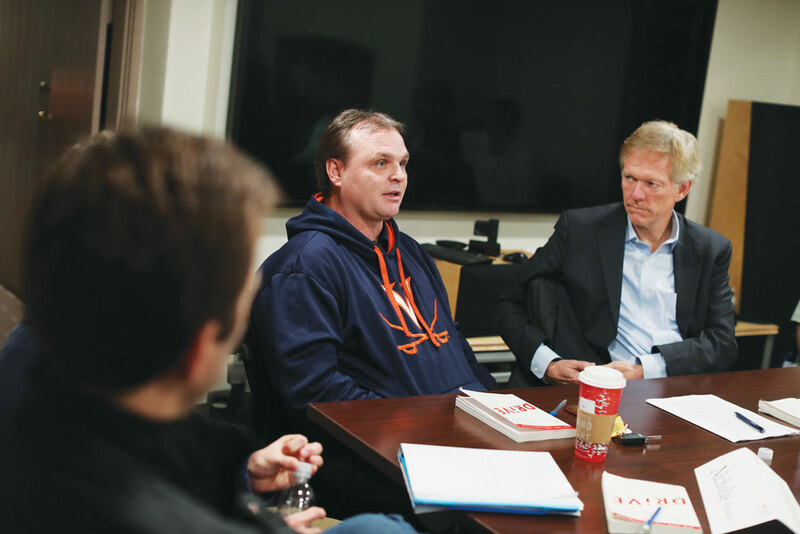 Welcome to “Maximizing Leadership Potential in Sports and Business,” a seminar for second-year M.B.A. students and select third- and fourth-year undergraduates that Beardsley and Virginia men’s tennis coach Brian Boland taught in the fall semester. How did a business guru and a tennis coach wind up teaching together? Each was interested in the other’s field. An avid tennis player, Beardsley saw the game’s concepts transferable to business. Boland saw aspects of global strategy—Beardsley’s specialty during 26 years with McKinsey & Company in Belgium—applicable to the tennis court. “Business and sports are very bottom-line driven,” Beardsley tells the 16 students who have convened at his Pavilion I residence. A class module is based on McKinsey & Company’s leadership strategy. For the final paper, students report on the results of course-long introspections pertaining to their leadership development. Boland teaches a six-level “Pyramid of Success,” from bottom to top: Privilege Mentality, Growth Mindset, Fitness and Nutrition, Base Game, Aggressive Game and Match Management. According to Boland, Rafael Nadal got to No. 1 with just a Base Game before adding an Aggressive Game. Performance is based on managing your energy, not your time. It is just as important to eat well, exercise and socialize as it is to get a full night’s sleep, according to one of the assigned readings. The Army, despite its organizational structure, doesn’t train leaders in a hierarchical manner. Instead, it teaches a dispersed method of leadership. In the course’s final session, Beardsley asks students to pick one thing that has strongly motivated them and identify the motivation as either intrinsic, something for which they’re internally wired, or extrinsic, driven by some form of outside incentive. To start the discussion, he confesses that when he was a student, he was “about as extrinsically motivated as you could possibly be,” earning both a Tufts University undergraduate engineering degree and an M.B.A. from MIT with highest honors. Ben Matthews (Engr ’17) says such discussions are typical of the semester’s two-hour classes—and not anything like what he experiences in the Engineering School. “You’re not just being talked at, but instead you’re sitting in a circle … where they basically spend the entire class asking you questions,” he says. At the end of the course, Beardsley asks the students how they want to be remembered in life, reduced to what might fit on a tombstone. “A great man is a sentence,” he explains. If the students needed to know the central theme of an upper-level seminar in leadership, he had just given it in one sentence. Unfortunately, as good as this article is, the pyramid of success introduced by Coach Boland is not his idea or concept. It was develop by Lee Taylor Walker in 2006 while coaching at the university of Memphis. Lee Taylor Walker is now the women’s tennis coach at TCU. He has shared this pyramid openly with the USTA and other coaches throughout the country. As it has developed and morphed over the years. Part of the pyramid is growth mindset which includes being inspired by success of others and learning from others (from the book - Growth Mindset: a new psychology for cucares). If you want the originator of the pyramid and how it was developed, I suggest meeting with Lee Walker.